A good gutter system is able to keep water away from your home in an organized and efficient manner. Our gutter maintenance and replacement company is committed to meeting all of your gutter needs. 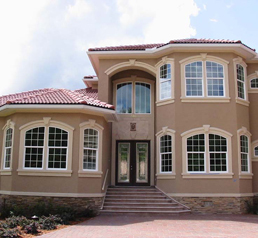 With a range of gutter services in Jacksonville, Florida, residents can depend on us for anything, from complete replacement to added protection. Because gutters are essential to shielding your home or business from water damage, you want to make sure that every part of your gutter system is functioning properly. Gutters operate on a simple principle. They collect rainwater, particularly runoff from your roofing, and divert it away from your home. Many contemporary gutter systems include a downspout, which takes the water and disperses it away from the walls. The gutter and downspout configuration protects the siding of your home, and it also protects your foundation from erosion. This seemingly inconspicuous fixture around your roofing works hard to ensure your property remains beautiful and has a viable value on the market. By ensuring your home has gutter protection, our company is able to help you maintain the condition of your home far into the future. With different options such as size and material type, we guarantee to provide a protective solution that works best for your gutters and roof. We offer gutter protection systems that are known for high levels of performance and are backed by lasting warranties. If trees are around your home, then you probably already know how much of an annoyance they are when it comes to your gutters. Branches hanging over your property almost certainly deposit loose twigs, leaves, pine cones, and other debris into your gutters. As a consequence, buildup tends to accumulate rapidly and create a mess for you to clean up. So, instead of digging leaves out and wasting your time, why not prevent such debris from settling in your gutters in the first place? The Leaf Relief protection system is a grill-like attachment that guards against debris buildup. It prevents leaves and twigs from settling in the gutter. Instead, they remain on the grill for easy cleanup. You can practically sweep debris away! By using Leaf Relief protection, homes and businesses won't have to worry about unnecessary water damage caused by poor performing gutters. There are no other solutions as effective and low maintenance as these gutter protection systems. Our technicians install these systems for a fraction of the cost of other gutter protection brands. With a manufacturer warranty guaranteeing 10 years of no clogs or overflows, you can't go wrong! Are you remodeling the exterior of your home? Gutter installation is a sensible and practical investment for your project. New gutters and downspouts are a great accent to your exterior design. Of course, choosing a new gutter configuration can also improve how efficiently your home disperses roof runoff. Count on our contractor to help you figure out the details. We’ll assess your current installation and design a new system for you. 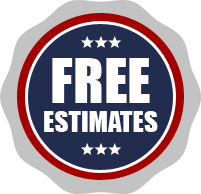 We’ll remove old fixtures and place your new investment, all according to your schedule and budget. Thanks to our commitment to delivering quality workmanship using state-of-the-art materials, you can have confidence knowing your project is in good hands. For quality gutter installation, as well as Leaf Relief protection and updates to your soffits and fascia, count on the gutter experts at our local company. Contact us to learn more about our gutter protection systems. We proudly serve property owners throughout Jacksonville, Florida, as well as Ponte Vedra, St. Augustine, Orange Park, and Jacksonville Beach, and the surrounding areas.